Truro City manager Steve Tully says he is planning to bring in up to three new players next week. The White Tigers are reeling after Monday's 6-0 defeat by Oxford City left them two points off the relegation places in National League South. 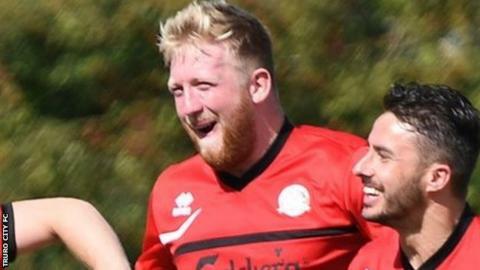 "We've given the lads who got promoted last year the chance to step up, but they just need a little bit of football knowhow," Tully told BBC Cornwall. "We hope to have two or three new faces by next week," he added. Former Torquay United youngster Ed Palmer has left the club having not featured in either match over the Bank Holiday weekend, when City were also beaten 3-1 by Gosport Borough. "We gave everyone the option (to leave) after the game on Monday," Tully said. "We've set standards at the club since we've been here about the way people train and the way people conduct themselves on and off the pitch. "The minute people drop below them we let them know. We felt that people weren't training the way they should have been and then you can't just turn up for a game and expect things to happen. "I will have a replacement in for Ed Palmer, I'm hoping to have a right-back in and obviously a centre forward."